Who: The program is for boys and girls 1st thru 8th grade. Learn how to pass, catch cradle, dodge, shoot and gather ground balls at this fast paced introductory clinic. 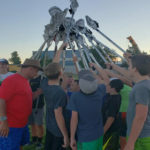 Taught by US Lacrosse Trainer and Coach Tom Welsh. Equipment will be provided. Bring water!